Nicola Scacciavillani first appears at Painesville Township, Lake County, Ohio, in 1906. When Nicola immigrated to the United States, Painesville, Ohio, was his destination. In America Nicola Scacciavillani was known Nick Square. Nicola Scacciavillani was born on March 30, 1892, at Frosolone, Isernia Province, Molise, Italy. Nicola was the eighth of nine children born to Felice Scacciavillano and Maria Giovanna Vitolone. He was baptized on March 30, 1892 at San Nicola Chiesa at Frosolone, Italy. He married Lucia Rossi, daughter of Francesco Paolo Rossi and Maria Grande, on August 3, 1914 at Mt. Carmel Catholic Church at Ashtabula, Ashtabula County, Ohio. Nicola died on August 1, 1953 at Lake County Memorial Hospital at Painesville, Lake County, Ohio, at age 61, of congestive heart failure. His body was interred at Saint Mary Catholic Cemetery at Painesville Township, Lake County, Ohio. 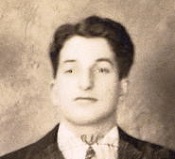 Nicola Scacciavillani, age 14, immigrated to the United States on October 4, 1906, traveling to Painesville, Lake County, Ohio. He was joining his four surviving brothers and his bother-in-law in Painesville. He entered the United States at the Port of New York City aboard the ship SS Prinzess Irene. 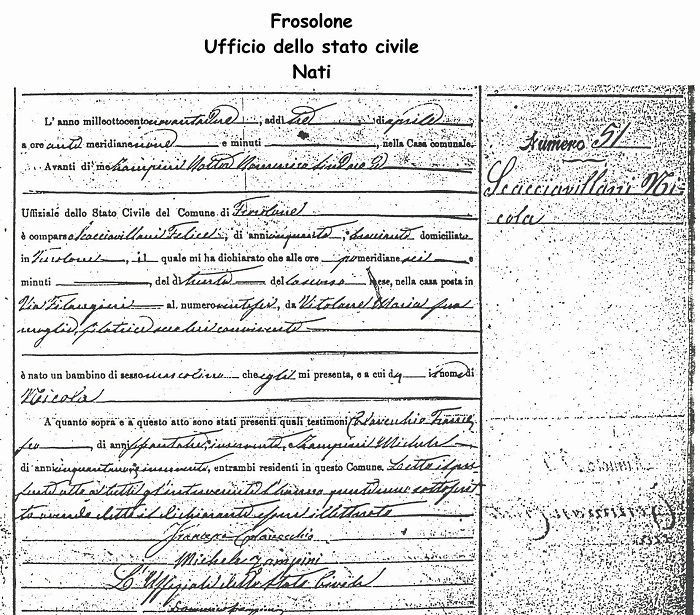 Nicola’s younger brother, Filippo (age 8) had passed away in March, 1906, at Frosolone, Italy. 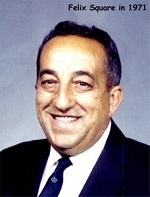 His brother, Giuseppe Scacciavillani immigrated to Painesville in 1898; brother Domenico Scacciavillani in 1900; brother Giovanni Scacciavillani in 1900; and brother Donato Scacciavillani in 1903. His brother-in-law (sister, Donata Scacciavillani’s husband), Cristofaro DiCristofaro, immigrated to Painesville in 1897. They all were working for the Storrs and Harrison’s Nursery Company at Painesville Township. Giuseppe and Giovanni were both married by the time Nicola immigrated. Nicola probably lived with Cristofaro, Domenico, and Donato in a Nursery Company owned shack on Lake Road. 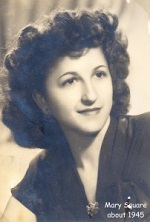 In 1910, Nicola’s sister, Teresa Scacciavillani, immigrated to Painesville, Ohio. 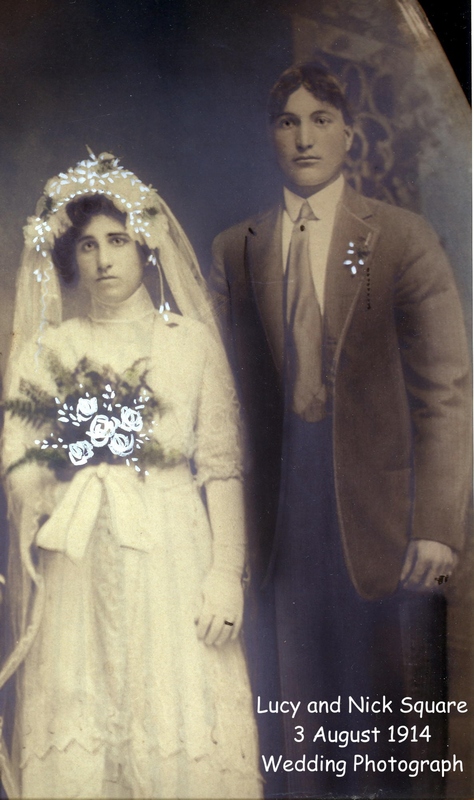 Nicola Scacciavillani was enumerated for the 1910 Census of the United States, on April 29, 1910, living at Lake Road, Painesville Township, Lake County, Ohio, as a boarder of his brother-in-law, Cristofaro DiCristofaro. Nicola Scacciavillani was enumerated as Nick Squar. He was employed by the Storrs and Harrison Nursery Company. Nicola registered for the military draft for World War One on June 5, 1917. He was living at Painesville Township, Lake County, Ohio. He was employed by the Diamond Alkali Company. Nicola’s name on the record was recorded as Nicola Scacciavillano. Nicola Scacciavillani was enumerated for the 1920 Census of the United States, on January 8, 1920, living at Fairport-Nursery Road, Painesville Township, Lake County, Ohio, as a head of household. Nicola Scacciavillani was enumerated as Nicola Scacciowanni. He was employed by the Diamond Alkali Company. Nicola Scacciavillani was enumerated for the 1930 Census of the United States, on April 17, 1930, living at Fairport-Nursery Road, Painesville Township, Lake County, Ohio, as a head of household. Nicola Scacciavillani was enumerated as Nick Square. Nicola was employed by the Storrs and Harrison Nursery Company. Nicola Scacciavillani was enumerated for the 1940 Census of the United States, on April 3, 1940, living at State Route 535, Painesville Township, Lake County, Ohio, as a head of household. Nicola Scacciavillani was enumerated as Nicola Scaccavillani. 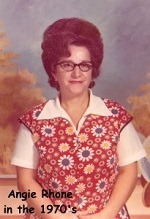 Nicola was employed by the F.P.& E. Railroad. 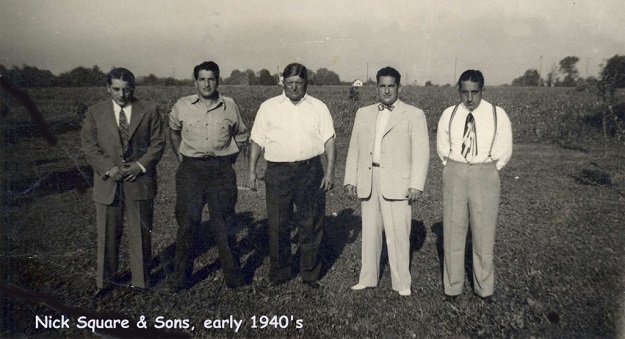 Nick Square was employed by the Storrs and Harrison Nursery Company from the time he immigrated to the United States until about 1915. His primary employer after 1915 was the F. P. & E. Railroad. He worked for them, part-time, from January 1915 until May 1926 and then he was a full-time employee from September 1932 to November 1952. Nicola Scacciavillani and Lucia Rossi had six children. They all had the same godparent’s, Teresa Scacciavillani (Nick’s sister) and her husband, Frank Carlucci. They all had the same confirmation sponsors, Tony and Anna (Stinziano) Cardina. 1. 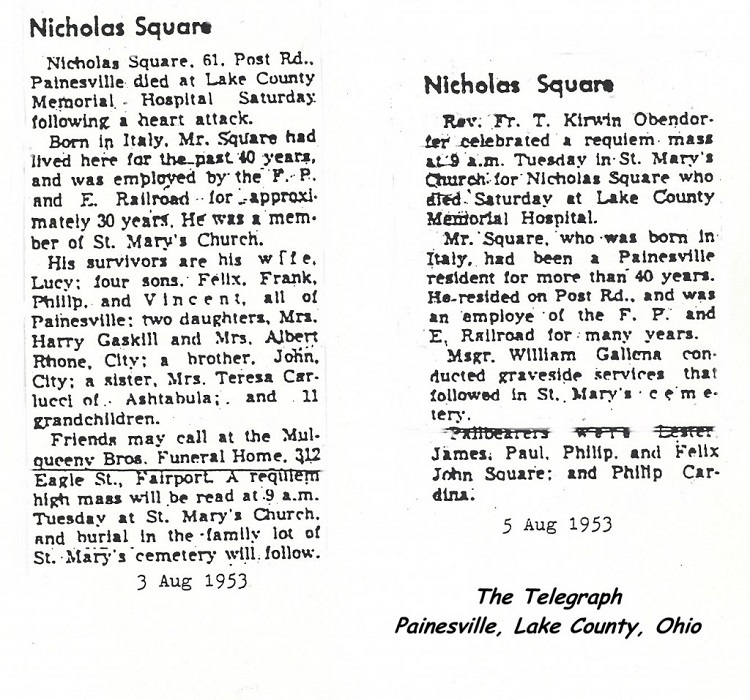 Felix Nicholas Square was born on Sunday, August 8, 1915, at his parent’s home on Post Road at Painesville Township, Lake County, Ohio. Felix was named in the traditional Italian manner; a first born son, he was named for his father’s father, Felice Scacciavillano. He was baptized on Sunday, September 12, 1915, at St. Mary Catholic Church, Painesville, Lake County, Ohio, by the Reverend William J. Gallena. He married Mary Elizabeth Venditti, daughter of Donato Venditti and Concetta Borrelli, on September 15, 1938, at Painesville, Lake County, Ohio. After the death of his first wife, Felix married Maria Bertolami in Italy. Felix died on October 28, 1978, at University Hospitals at Cleveland, Cuyahoga County, Ohio, at age 63, of cancer of the ureter. His body was interred at Riverside Cemetery at Painesville, Lake County, Ohio. 2. Frank Dominic Square was born on June 18, 1917, at his parent’s home on Post Road at Painesville Township, Lake County, Ohio. Frank was named in the traditional Italian manner; a second born son, he was named for his mother’s father, Francesco Rossi. Frank Square served in the Army of the United States, with the Cavalry, during World War II. He married Jean Lottie Palmer, daughter of Chester Palmer and Mary Jacinth, on December 23, 1944, at St. Mary Catholic Church at Painesville, Lake County, Ohio. Frank died on May 9, 1971, at Cleveland Veteran’s Hospital at Cleveland, Cuyahoga County, Ohio, at age 53, from prostate cancer. His body was interred at Perry Cemetery at Perry Township, Lake County, Ohio. 3. Philip Anthony Square was born on December 18, 1918, at his parent’s home on Post Road at Painesville Township, Lake County, Ohio. Philip was named in the traditional Italian manner; a third born son, he was named by his father. He was named for Nicola’s brother, Filippo Scacciavillani, who died at age 8, in 1906. 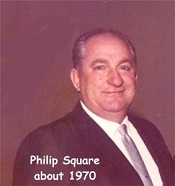 Philip Square was a highly decorated veteran of World War II. This web-site is dedicated to his memory. Phil met Olive M. Seabolt, daughter of James Seabolt and Lula King, sometime after the World War II. They lived together from the late 1940’s until Phil’s death in 1978. Phil and Olive were never legally married. Olive was previously married to Charles Heath. Philip died on February 16, 1978, at Lake County Memorial Hospital, Painesville, Lake County, Ohio, at age 59, of an acute myocardial infarction. His body was interred at Riverside Cemetery at Painesville, Lake County, Ohio. 4. 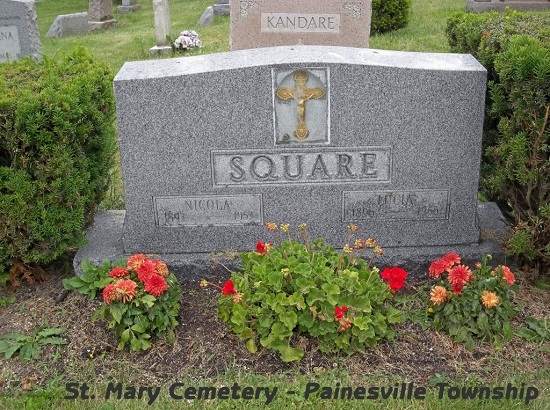 Marion Lucy Square was born on Saturday, January 29, 1921, at her parent’s home, on Post Road, at Painesville Township, Lake County, Ohio. Mary was named in the traditional Italian manner; a first daughter, she was named for his father’s mother, Maria Vitolone. She married Harry Alexander Gaskill, son of Harry D. Gaskill and Ethel Warnock, on July 16, 1949, at Painesville, Lake County, Ohio. Marion died on May 1, 1963 at Lake County Memorial Hospital at Painesville, Lake County, Ohio, at age 42, of acute monocytic leukemia. Her body was interred at Riverside Cemetery at Painesville, Lake County, Ohio. 5. 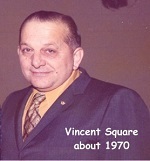 Vincent Carmen Square was born on March 7, 1923, at his parent’s home on Post Road at Painesville Township, Lake County, Ohio. Vincent was named in the traditional Italian manner; it was his mother’s turn to choose his name. He was named after his mother’s brother, Vincenzo Rossi. He married Dorothy Marie Kammerer, daughter of William Kammerer and Ivah M. Brainard, on June 1, 1946, at Painesville, Lake County, Ohio. Vincent died on March 29, 1979, at the Cleveland Clinic Hospital at Cleveland, Cuyahoga County, Ohio, at age 56, from shock after heart surgery. His body was interred at Perry Cemetery at Perry Township, Lake County, Ohio. 6. Angeline Lucy Square was born on Friday, May 15, 1925, at her parent’s home, on Post Road, at Painesville Township, Lake County, Ohio. Angeline was named in the traditional Italian manner; as second born daughter, she should be named after her mother’s mother – Maria Grande. Since the name Maria was “taken” by an older sister, Angeline was named after her mother’s god-mother, Angela Frabbota. She married Albert Lee Rhone, son of Harry Albert Rhone and Anna May Perry, on Saturday September 15, 1951 at the St. Mary Catholic Church Parish House at Painesville, Lake County, Ohio. Angeline died on July 6, 2002, at her home, 137 Lee Road, at Painesville Township, Lake County, Ohio, at age 77, of malignant lymphadenopathy. Her body was interred at Riverside Cemetery at Painesville, Lake County, Ohio.